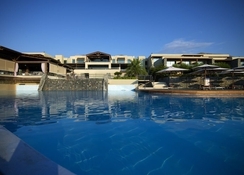 Aquagrand Resort is a five-star adults-only hotel located on the beautiful island of Rhodes, Greece. The hotel offers a variety of amenities such as swimming pools, bars, restaurants, sauna, Jacuzzi, conference centre and water-sports. Guests feel at home in the hotel’s spacious, beautifully decorated rooms and suites which are fully equipped and offer magnificent views of the Aegean Sea. Aquagrand Resort is the ideal place for relaxing and pleasant vacations. This award winning hotel is among the best on the island of Rhodes. There are two excellent restaurants onsite as well as a pool bar, a conventional bar and beach restaurant – all of which serve scrumptious meals. There’s a strict dress policy that guests are required to adhere to. 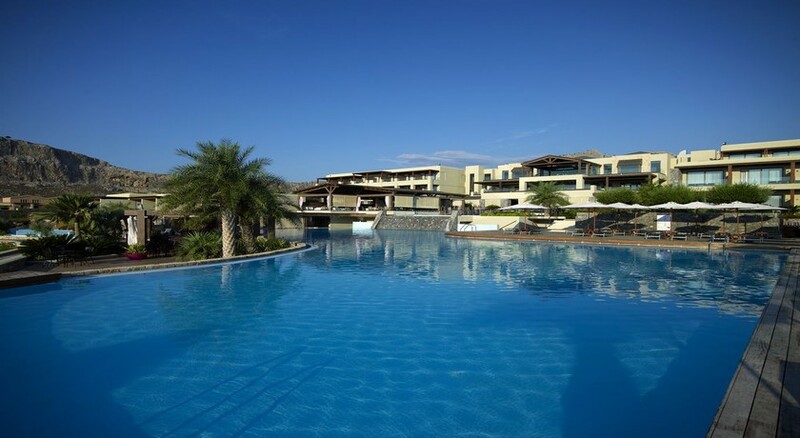 Located next to a gorgeous beach in Lindos, Rhodes, the Aqua Grand Resort Hotel isn’t too far from the beach. 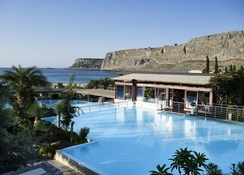 The hotel is only 3km from downtown Lindos, while Rhodes is about 50km. St. Paul’s Bay is 2.3km from the hotel; St. Paul’s Chapel is 2.2km. Rhodes International Airport is about 54km from the hotel. 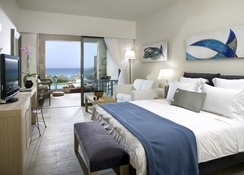 The guestrooms at the Aqua Grand Resort Hotel Rhodes are spacious and comfortable. They are categorised as Queen's Maisonette with private pool, prestige pool suites, sea front private pool suites, private pool suites, honeymoon suites, seafront suites, premium sea view, exclusive guestrooms, princess seafront guestrooms and princess private pool suite. All the guestrooms and suites come with the necessary amenities including satellite TV, safe (extra charge), temperature controlled air conditioning, bath amenities, hair drier, housekeeping, wakeup call, Wi–Fi and concierge services. The hotel features two restaurants, a bar, a pool bar and a beach restaurant. The Pentapolis Main Restaurant serves a breakfast buffet in rich American style along with traditional delicacies. For lunch and dinner, guests can head over to the Blue Fin restaurant that serves excellent sea food. Next to blue fin restaurant is the Sensia Beach Bar Restaurant that offers lunch, snacks and a variety of beverages. The Olivino Pool Bar Restaurant serves a scrumptious a la carte lunch and offers beautiful views of the sea. The Zen Bar is set in a cosy environment and hosts live music events on most days. Here you can enjoy a variety of cocktails, wines, spirits and beers. 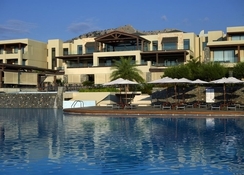 The Aqua Grand Resort Hotel Rhodes features a state of the art fitness centre and gym. The onsite spa offers guests a wide variety of massages and facial & body treatments along with manicure pedicure. There’s also a Jacuzzi, sauna and hammam. Guests can also take part in yoga at the hotel. the establishment offers a one of a kind in room massage service as well.